For a business to succeed in today's world, it is important to have a strong digital impression within the internet. Therefore, when a business is defining its marketing plan, it must incorporate a solid digital strategy. How much value you have on each of the following factors correlates to how successful your business can be online and in the real world! Never under estimate your business and its potential marketing objectives. It is important to think about the big picture when deciding on where to focus your resources. Ask yourself - What is the one factor my business success relies on? What drives your revenue, repeat business, engagement and loyalty? How often and through which channel are customers receiving information? What content is most effective for customers to push past purchase roadblocks? Where should messages be placed along the journey? These are all questions that you need to be able to answer and address in order to better market your business in the digital marketing realm, and with digital methods of communication and marketing becoming faster, more versatile, and streamlined, it is perhaps unsurprising that once new technology becomes available we quickly move further into the digital age. If you don't have a mobile responsive website by now - you are really missing out on potential audiences. Mobile is now dominating the market and surpassed desktop browsing. People become easily frustrated with small text that needs to be zoomed in and out repeatedly to gather the information they want...generally they will simply leave your site for another that is more easily available to them. Now is the time to ensure that your website is easily accessible on all platforms. Consumers get their information online through a variety of methods, the most prominent being search engine results. The first part of getting your website in front of potential customers and clients is to correctly optimize your website. Optimizing your website correctly will help the search engines identify what your site is all about, and how it relates to what the user is looking for. Implementing a solid organic search strategy will increase your website's visibility within the search engines and help drive more traffic to your website, increasing your potential for a variety of positive opportunities. Content is key! It builds trust and loyalty and can help define you as an expert in your chosen field. Good content promotes your credibility as well as your SEO. Regular, original, relevant and engaging content that enhances your brand will help build a positive relationship with your potential customer base. Utilizing a blog on your website is a great way to provide fresh and relevant content, this can lead to an increase in site visitors, user engagement, which both work to drive conversions. 7. Social Media is essential! Social media marketing is a great medium for a business to build and increase brand presence throughout the Internet. It also provides a very powerful tool to share information and distribute content about products and services. Utilizing a variety of social media platforms creates new opportunities to interact and connect with potential customers and clients. It is important to be active across all social channels, allow people to know what you are up to - this builds trust and interest in your company and brand. It's important to communicate WHY the user should be on your website. Whether it's a percentage off one single item, or a free incremental item with mobile purchase. Cross-promote with your loyalty program or using event based promotions - it is integral that you show the value of your engagement through mobile or email, which in turn can lead to improved sales and engagement. This is far from an exhaustive list, and new forms of digital marketing are arriving all the time, so it is important to stay ahead of the game! 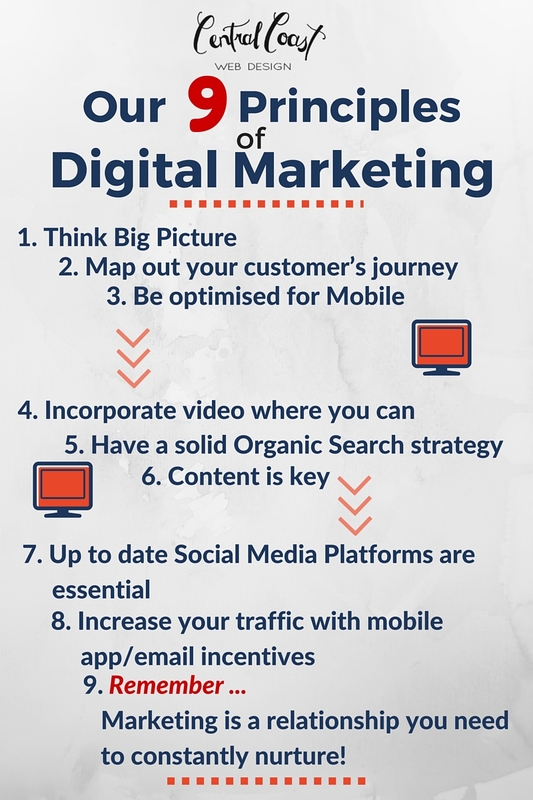 If you need help with any of these Digital Marketing principles contact us on 02 4341 3313 02 4 341 3313 via email. We are happy to help your business shine online and establish clear strategic goals. Overall it's important to remember digital marketing is a rapidly growing force in the current marketing playing field, and will soon be the future of marketing, as digital media continues to dominate over more traditional forms of marketing.